Over ten years of experience in aluminum composite material field have made us an experienced advertising aluminium composite panel manufacturer and supplier in China. All our composite panels are made in strict conformation with ISO9001:2000 quality management system and they are now CE, SGS, CTC and ASTM certified. As a specialized aluminum composite panel manufacturer and provider, we provide our customer with 5-8 years warranty on ACP for exterior applications and 15 years warranty on ACP for interior applications. The following details our different types of advertising ACP. HAIDA-LITE is an aluminium composite panel designed for use in advertising, sign making and other projects where high load-bearing capacity is not required. The thickness of advertising aluminium composite material is available in 2mm, 3mm and 4mm. The standard panel sizes are available in 1500×4050mm,1500×3050mm,1220×2440mm, and 1250×2500mm, etc. Our advertising composite panel is usually composed of two layers of colored aluminum coil and a polyethylene core. The aluminum coil thickness comes in 0.15mm, 0.21mm, and 0.3mm, and the panel core is made from first class PE thermoplastic material. The face side and back side of our advertising aluminium composite panels are produced with high gloss finish and matt finish, respectively. For more detailed specification information, please read the Parameter Forms at the lower part of the page. HAIDA-LITE is subject to 5 years warranty when the composite material is used for exhibition design, sign making, POS displays, retail design, industrial design, and transporting applications, etc. This is a new solution for digital printing. This type of aluminium composite panel is coated with a specially designed coat which provides the panel with improved ink adhesion. In addition, the complete flatness of HAIDAI-DIGITAL makes the surface look perfect. The panel features high ink adhesion force, complete flatness, high rigidity, etc. and it can be curved and folded. 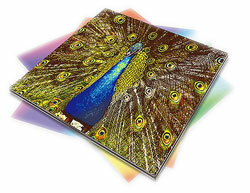 The images printed on the advertising aluminium composite panel are long lasting and fadeless. HAIDA DIGITAL panels can be machined after printing, with no cracks or damage to the surface. Standard size available: 1220×2440×3mm white matt and 1500×3050×3mm white matt. The panel color may be customizable, according to your order quantity. This aluminium composite panel is perfect for traditional screen printing as well as hand printing. After printing, the panel can also be laminated with special films or coatings to protect the surface and create a high gloss finish. Vinyl letters can also be easily applied onto the panel surface. In addition to advertising ACP, we can also offer building ACP, brush ACP and FEVE aluminum composite panels for you to choose from. We are located in Jiangyin City which provides us with easy land, water and air transportations. So, our material transportation cost and customers international freight charge are both greatly reduced. We welcome global customers to contact us for more product information. We are happy to serve you.